“Today’s streets need to be redefined as public spaces; as habitable places; as community spaces; as an extension of housing territory; as a space for games, greenery, history and local life of neighbourhoods”- stated the annex to the SUMP – sustainable urban mobility plan – issued by the Municipality of Barcelona for the period 2013-2018. On 12-13 November 2018 UNIMED, took part to a study visit to Poblenou superblock in Barcelona in the framework of the midterm event of the GO SUMP project, featuring the MED Urban Transports Community, which gathers seven Interreg MED-funded projects working on sustainable urban mobility plans. 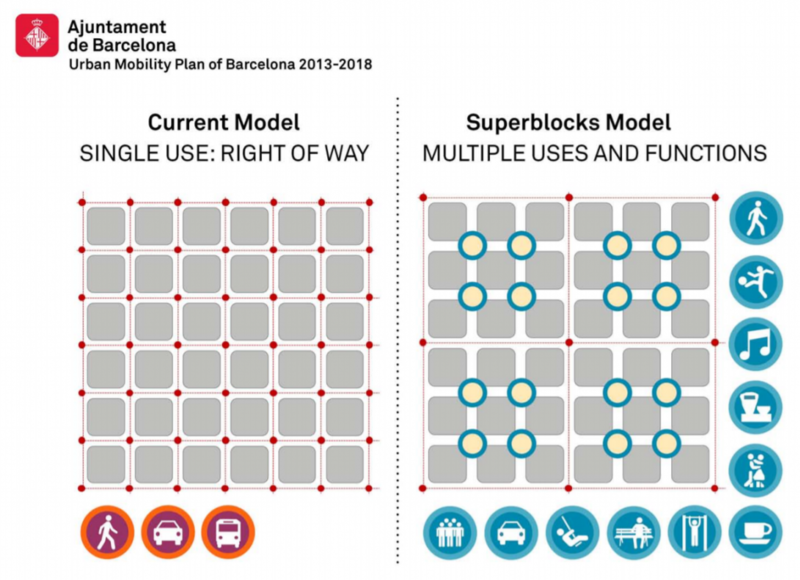 In 2015 the first superblock was inaugurated in Poblenou, a north-eastern neighbourhood of Barcelona (Spain). It is a conceptual model that has been increasingly implemented in recent years as a structure to manage urban mobility, combined with innovation of the habitable urban spaces, and found a great application in cities unable to reduce 100% of their carbon emissions. A superblock is a grid of quadricules measuring about 400*400 mts, which incorporates regular blocks with an “interior” and an “exterior”. The interior component has a reduced speed of max 10 km/h and gives preference to pedestrians. Some inner streets are generally reserved for residential traffic, services, emergency vehicles, and loading/unloading vehicles under special circumstances while the exterior, namely the perimeter, is dedicated to motorized traffic. According to the Barcelona Municipality, which relied on the expertise of BCNEcologia- Agencia de Ecologia Urbana de Barcelona to design the first superblock of the city, these “are becoming a new concept of urban order, made up of an integrated network of relationships that highlights today’s neighbourhoods, streets, buildings and activities; and which promotes the reclaiming of public space and a sustainable mobility system for connecting all these. Citizens’ lives are also changing, through better access and the promotion of local social relations”. Since 2016, UNIMED is partner in the three Interreg MED projects: BleuTourMed, GO SUMP and PANACeA, co-funded by the ERDF – European Regional Development Fund under the umbrella Programme Interreg MED, with a role specialising in communication and knowledge management within the three thematic communities of projects. UNIMED represents in these projects a partner with a strong commitment towards sustainable development issues and with a solid expertise in matters of Transports&Logistic in the Mediterranean, thanks to its academic SubNetworks. UNIMED plays a relevant role within these types of projects whose aim is to promote the results of the territorial cooperation projects funded in the framework of the Interreg MED Programme. Furthermore, the participation of UNIMED in these projects strategically helps expertise in managing knowledge and communication, while widening its knowledge and strengthening the operational network at the benefit of its community of associates and subnetworks. GO SUMP The MED Urban Transports Community is one of the thematic communities of the EU Interreg MED Programme. The Community currently gathers 6 projects working towards achieving tailor-made sustainable urban mobility plans and solutions in the Mediterranean area. The MED Urban Transports Community is supported and animated by the GO SUMP project. The GO SUMP partnership is composed of Malaga Council, RDA Green Karst, EUROCITIES, BIC Euronova, MEDCITIES, CODATU and UNIMED – Mediterranean Universities Union, which aims at improving the visibility and the communication reach of the projects of the community, to create synergies among them and to capitalise and mainstream their results. Using a bottom-up and a top-down approach among the Community projects and relevant policy-makers and interest groups, GO SUMP acts as a bridge enhancing dialogue, promoting the transfer of knowledge and amplifying the impact of the projects of the community.